Since 1999, at each annual World Summit of Nobel Peace Laureates, a Committee made up of Nobel Peace Prize Laureates presents a Peace Summit Award. The Award is presented to personalities from the world of culture and entertainment who actively stand up for peace and make broader audiences aware of issues in the contemporary world. The initiator of the Award was Mikhail Gorbachev, himself Laureate of the Nobel Peace Prize in 1990. Recipients of the award over the years have included singers, actors and even a football player. Musician Peter Gabriel was honoured with the Award for his commitment in his artistic activity against violations of human rights and his firm stance against violence and war, like in his song “Biko” in which he sang about Steve Biko, an anti-apartheid activist in South Africa, killed in 1977. Among musicians acknowledged for their advocacy of peace, there is also Bono, lead singer of the Irish rock band U2, honoured for his engagement in the cancellation of debt in third world countries. Singer Annie Lennox, known for her musical work with the Eurythmics, was recognised for her work against the HIV pandemic in South Africa. Other musicians whose charitable activities have been honoured include Cat Stevens and Bob Geldof, organisers of the “Live Aid” and “Live8” concerts. Actors have also been among Peace Summit Award Laureates, including Sharon Stone, George Clooney and Don Cheadle. 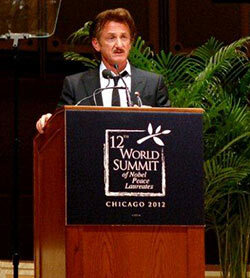 The Committee honoured them for their “strong engagement in favour of pacification in the tortured Darfour region, for having contributed to saving human lives and to alleviating the suffering of the civil populations victims of the war.” Other actors who have been presented with the Award are Sean Penn and Roberto Benigni. Also, an Italian ex-football player, Roberto Baggio, was recognised by the Committee. After the end of his sports career in 2004, the ex-forward player of AC Milan and Juventus, among others, vice-champion of the world of 1994, devoted himself to charity. He was chosen for the Peace Summit Award for his efforts to improve the conditions at hospitals and charities all over the world. Baggio personally raised funds for earthquake-stricken Haiti, called to help the people of Burma affected by the Nargis Cyclone in 2008. He also worked to eliminate the bird flu epidemic in Laos. The Award has also been presented to organisations such as the PeaceJam Foundation and Nihonhidankyo. The decision to honour an individual or entity with the Award is taken by a special Committee made up of Nobel Peace Laureates. For the initial eight years, the Laureates’ Committee meetings were held in Rome and were chaired by Mikhail Gorbachev and the mayor of the Eternal City. Since 2008, the “capital of peace” has changed every year – the Award has so far been presented in Berlin, Paris, Hiroshima, Chicago and Warsaw.